The prevalence of secondary hyperparathyroidism (SHPT) is high after bariatric surgery. Vitamin D is supplied to counteract SHPT and bone disease, and we studied vitamin D associations with SHPT. 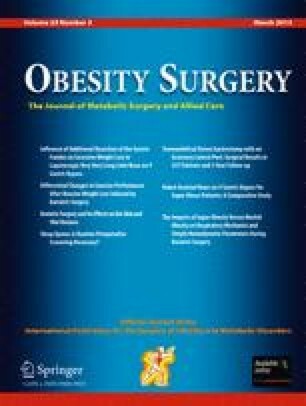 We measured serum levels of 25-OH vitamin D and parathyroid hormone (PTH) 5 years after gastric bypass and duodenal switch. One hundred twenty-five patients were included, of whom 114 (91 %) had undergone gastric bypass and 11 (9 %) had undergone duodenal switch. SHPT was defined as PTH > 7.0 pmol/l in the absence of hypercalcemia. 25-OH vitamin D levels were divided into three categories: <50, 50–74, and ≥75 nmol/l. Serum ionized calcium, magnesium, phosphate, and creatinine were divided into tertiles. Mean age ± SD was 44 ± 9 years at 5 years follow-up. Ninety out of 125 (72 %) patients were women. SHPT was present in 45 out of 114 (40 %) gastric bypass patients and in 11 out of 11 (100 %) duodenal switch patients. The prevalence was high in all vitamin D categories studied. An inverse association between ionized calcium and PTH was found. For the gastric bypass patients, the odds ratio for SHPT in the upper two tertiles of ionized calcium was 0.35; 95 % CI, 0.15–0.79; p = 0.011, compared with the lowest tertile. Supplements of vitamin D and calcium were not associated with a lower prevalence of SHPT at 5 years follow-up. The prevalence of SHPT was high 5 years after gastric bypass and duodenal switch. SHPT was inversely associated with serum ionized calcium, but not with vitamin D. The supplementation used was insufficient to compensate for the impaired calcium absorption after surgery. We are especially thankful to the whole multidisciplinary team at the Department of Morbid Obesity and Bariatric Surgery, Oslo University Hospital Aker for their participation and follow-up before and after surgery. We are also thankful to Peter Abusdal Torjesen and Solve Tjora at the Hormone Laboratory and the Central Laboratory, respectively, for reviewing the section with the methodological aspects of the serum analyses. Torgeir T Søvik received travel support from Johnson & Johnson. Jon Kristinsson received travel support from Covidien and Johnson & Johnson. Thomas Bøhmer received royalties from Nycomed Pharma. Erik Fink Eriksen has received travel support and speaker fees from Lilly, Novartis, Amgen, and IDS. Tom Mala has received speaker fees from Johnson & Johnson and travel support from Covedien. Stephen Hewitt, Erlend T Aasheim, Jørgen Jahnsen, and Grethe S Birketvedt did not report any form of conflicts of interest.